On the heels of impressive performances by its debaters in the United Kingdom last month, Bates College sends five teams to this year’s World Universities Debating Championships in Dublin, Ireland, from Dec. 27 through Jan. 4. Accompanied by debate coach Bryan Brito and three student judges (junior Rakhshan Zahid of Karachi, Pakistan; senior Katie Celeste of Croton, N.Y.; and junior Matthew Robinson of Washington, D.C.), the Bates squads will compete against more than 300 international teams. Bates pairs competing in Dublin are: senior Adrienne Maxwell of Somers, Mont., and senior Jon DeCarlo of Poland, Ohio; juniors Michael Neville-O’Neill of Rowley, Mass., and Ryan Creighton of Lyme, N.H.; Bajpai and Casey Pfitzner of Spotsylvania, Va.; senior Jeremy Fisher of Mount Kisco, N.Y., and senior Michael Metzger of Wellesley, Mass. ; and sophomore Brendan Jarboe of Acton, Mass., and junior Robert Yamartino of Middlefield, Conn. In mid-November, Bates traveled to intervarsity debate tournaments in Newcastle upon Tyne and Durham, both in England, where more than 60 teams and 120 debaters participated. The Bates team of Creighton and Neville-O’Neill won the Durham tournament and reached the finals in Newcastle. Pfitzner and Bajpai placed 12th in Durham, where Bates debaters were recognized as among the top speakers. The team’s November victories were followed by a solid performance in early December at Cambridge University, where DeCarlo and Maxwell placed 20th in a field of 88 teams. The Bates team of Zahid and Celeste placed 31st. 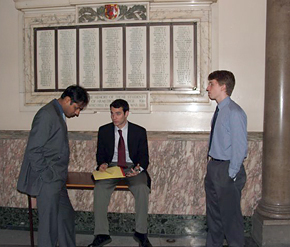 From left to right: Juniors Vaibhav Bajpai, Ryan Creighton and Michael Neville-O’Neill prepare for a November debate tournament in Newcastle upon Tyne.